In the above linked challenge the task was to create an interpreter for the esoteric language ;#. #: Modulo the accumulator by 127, print the corresponding ASCII character and reset the accumulator to 0. Because I am lazy but still want to test some more testcases, I need a program or function which converts plain text to ;# code. The input is a string, taken either as argument or through stdin. 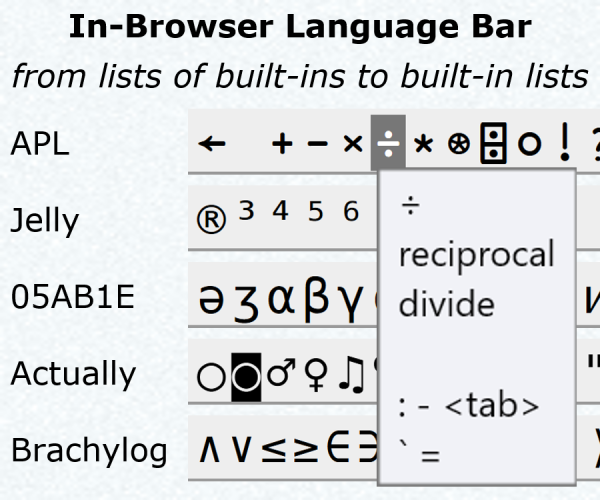 It will only contain printable ASCII characters and newlines. The output is the generated ;# program by returning, or printing to stdout. As long as the program is valid, it may contain excess characters other than # and ; as all other characters are ignored. Note that the input has a trailing null byte. Try it online! Input is terminated with a null byte. The code is split into two parts: generation and iteration. 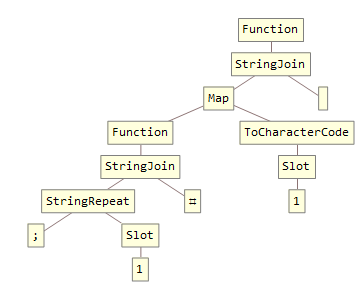 ■       Map the rest of the program over  all code points C of the input. 2        Multiply; repeat ';' C times. Go to Post Office: west 1st left 1st right 1st left. Pickup a passenger going to Chop Suey. Go to Chop Suey: north 1st right 1st left 4th right 1st left. Switch to plan "e" if no one is waiting. Pickup a passenger going to Charboil Grill. Go to Charboil Grill: north 1st left 3rd left 3rd left. Pickup a passenger going to The Underground. Go to Writer's Depot: west 1st right. ; is waiting at Writer's Depot. Pickup a passenger going to Post Office. Go to Post Office: north 1st right 2nd right 1st left. Go to The Underground: north 1st right 1st left. Switch to plan "n" if no one is waiting. Go to Zoom Zoom: north 3rd left 2nd right. Go to Writer's Depot: west. # is waiting at Writer's Depot. Go to Writer's Depot: north 3rd left 2nd left. Pick up stdin and split it into characters. Covert each character to ASCII. Print ";" as you count down from that ASCII to zero. Pickup the next character and repeat until done. Null byte terminates the program. Input is STDIN, output is STDOUT. In ><>, characters and ASCII codes are the same thing, so all we need to do is read a character, print ";" and decrement the character until it's 0, then print "#" and loop until there's no more input left. let c i=System.String.Join("#",Seq.map(fun c->String.replicate(int c)";")i)+"#"
"#",      // join the following char seq with "#"
convert "Hello, World!" |> printfn "%s"
convert "ABC" |> printfn "%s"
convert ";#" |> printfn "%s"
Pretty straightforward. Takes input as command-line argument. Output is a valid ;# program that prints the requested text. See also: ovs's answer, which takes a similar approach, but with a different method of generating constants and a different cell layout. This challenge lines up with the brainfuck spec pretty well, which means the solution is essentially trivial. Brainfuck takes input as ASCII values, which is exactly what ;# need to output as. The schematic for transpiling is simple: Generate the ASCII value for ; and #, print ; equal to the ASCII value of the input character, print #, repeat for every input. Converts the input string to a list of character codes, then Maps the function StringRepeat[";",#]<>"#"& over the list, then StringJoins the result with the empty string. If the value on the stack is True (we read a newline), that code means: do (`) put a character literal on the stack ('), which is a newline: \n. If the value on the stack is False (we didn't read a newline), that code means: don't (`) read a character literal ('). That means the next character is executed as a command. Fortunately, a backslash escapes the next command (it makes it so that it doesn't get executed), so n doesn't print a newline (which is what n usually does). The rest of the code is straightforward; we convert the character on the stack to the integer of its unicode codepoint (o), we push a literal semicolon (';), multiply the number with the string (*, like in Python), print the result, push a literal (') #, print it too, and go back to the Origin. Run with -F if you want to see immediate results (because buffering), but it works without, too. ';           Push the code point of ';' (59). @j         Push the entire input as a list of code points. x        For each code point in the input, repeat 59 that many times. '#      Push the code point of '#' (35). p  Flatten and print as unicode characters. To run, you must enclose the input string in quotation marks. -5 bytes thanks to Jo King. 1 byte saved thanks to Neil. If we can take input as an array of individual characters then 5 bytes can be saved. If we can also output as an array then 2 more bytes can be saved. 24 bytes, plus the -n command line switch to repeatedly operate on stdin. 3 bytes saved (and output corrected on newlines!) thanks to manatwork. '#    Push 35, the code point of '#'. I     Read a code point C from STDIN. Pushes -1 at EOF. by zero. For C > -1, this just gives back C, so it does nothing. &';   Pop C and push that many 59s (the code point of ';'). d     Push the stack depth, which is C+1. &O    Print that many code points from the top of the stack. loop processes the next character. Not the answer you're looking for? Browse other questions tagged code-golf code-generation or ask your own question.